I am aboard The Escorte, a twin screw tractor tug fitted with Voith-Schneider cycloidal drives that allow for incredible manoeuvrability uniquely suited for moving ice. We are at Goderich, Ontario, situated on the north shore of Lake Huron - home of the largest salt mine in the in the world. The winter of 2017/18 is seeing a most unusual build-up of ice that is usually not seen until early March. 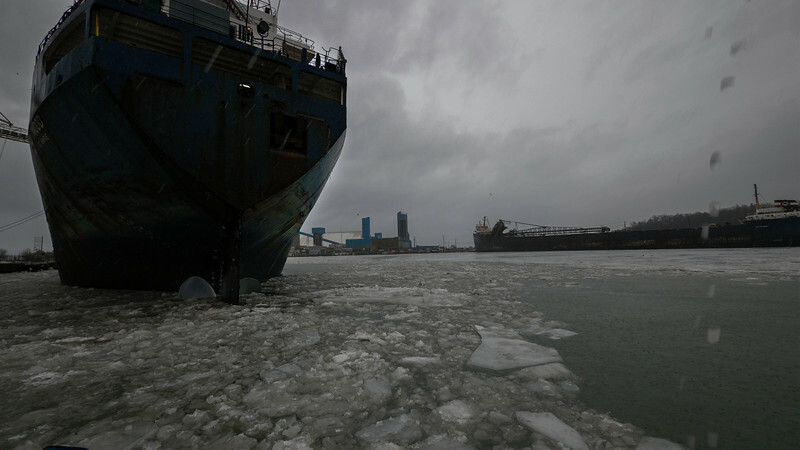 A tugboat captain must understand how to create ponds into which ice may be directed while taking into consideration wind, waves and the motion of the tug itself. Too much chewing up of ice shall create slush that soon freezes solid. Too much movement of ice without a place for it to disperse simply complicates and prolongs the operation costing the client many thousands of dollars.